Frisbie Janitorial Service - Complete janitorial services serving commercial, government, and business companies. Since 1974, Frisbie Janitorial Service of Amarillo, TX has been serving commercial and industrial owners with professional janitorial services in the area. We have 60+ employees who are drug and screened and safety trained. Expert office cleaning for small business, large national corporations or government agencies, Frisbie Janitorial provides your facility with expert cleaning services. Our commercial cleaning services include scheduled office cleaning, building maintenance, floor cleaning and restoration, restroom cleaning, exterior clean-up, windows, and more. 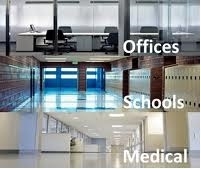 We have a trained staff of janitors, professional supervisors, Green chemicals and techniques, the right cleaning equipment, security procedures, programs, and equipment to handle specific office cleaning needs for any office building. Carpet cleaning for small and large businesses. We have advanced high performance and heavy duty equipment to do business carpet cleaning on a regular maintenance interval or on a when needed basis. Our business is located in Amarillo Texas unlike other companies that are headquarters in another state and sub-contract out janitorial services. Our office cleaning staff are trained in the most efficient and advanced techniques available and come equipped with the proper materials and modern equipment. We take pride in our employees. Simply put, we are experts in the services we provide. Over 40 years in business and a privately owned company by the original owner. Our customers are typically within a 90 mile radius of Amarillo. Exceptions are made depending on services needed. Fully insured for your protection !